Are you ever struck with a flavor combination that is so amazing you astound yourself with how delicious it is? And you are a little upset with yourself for not thinking of it before? This was one of those. 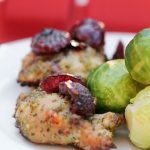 I feel like cherries and basil pesto go together so amazingly over juicy chicken thighs. 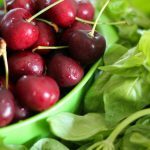 This wasn't the first time we have paired basil and cherries, Our Iced tea is a hit! I was actually making our iced tea and thinking about what to make for dinner when this struck me. 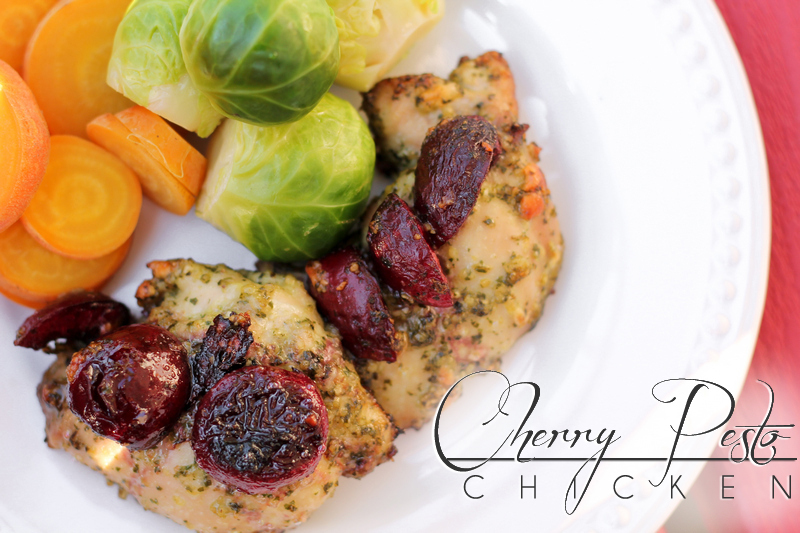 Cherry pesto chicken is the perfect balance of sweet and salty! Well? How are things? Enjoying the summer months? It's been a whirl of activity around here. I am up to my usual crazy summer work schedule and have had family in town. It has been insane really. Nonstop action. Plus with the early hot weather, things are coming in up to 3 weeks early; cherries usually in full swing right now, are almost done. I feel like I am missing my canning window… dang it. Raspberries are done, blueberries are almost done, and peaches are right around the corner. I was going to tell you about my recent family visit, I took my nephews for 2 days. We had an action-packed fun time- but today, I'm going to abandon you all for a pile of jalapenos sitting on my counter. 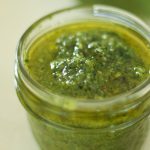 You have paleo friendly jalapeno preserves of some sort to look forward to. Hopefully, that is enough to console you and diminish the feeling of abandonment you now feel. 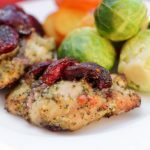 Of course, you could always console yourself with these amazing cherry paleo pesto chicken thighs! 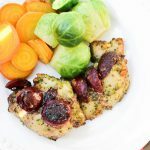 Classic pesto flavour with a paleo twist, you don't even miss the cheese! Wash basil and pat dry, lightly press into a measuring cup. 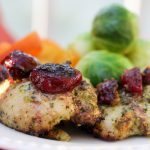 Add to a food processor or blender. Add; Garlic, 1/3 cup avocado oil, nutritional yeast, toasted pine nuts, and salt. Puree until it forma a loose paste. 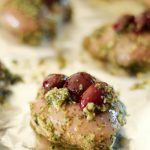 I put Mine into freezer safe containers in 1/4 cup portions, leaving enough space to top with the remaining 1/3 cup avocado oil. Stir in the cheese at the end if you are NOT freezing the pesto. 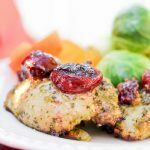 Fresh Cherry paleo pesto chicken is the perfect balance of sweet and salty. 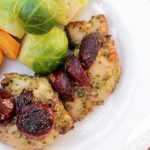 Place chicken thighs, cherries and pesto in a bowl. 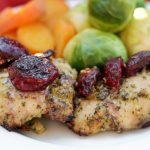 Massage pesto/cherries into the chicken, let sit for 10 min. 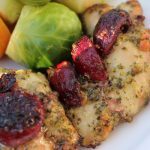 Place on a lined baking sheet spooning excess pesto and cherries over top of the thighs. You had me at Cherry! When I made this, I was sooooo full, but couldn’t stop eating! Have missed hearing from you two this summer. Looking forward to hearing/seeing more recipes. I can say I’ve missed blogging! Hey, Raj, have you used up those sour cherries you took home in May? The tree is loaded again, so eat up and I will make sure you get some more! No I haven’t. I just discovered them actually. But with the upcoming move, I’m looking to use everything up for now. But Holley says that she’d love some!